Workers secure a tire assembly recovered from the Lion Air jet that crashed after takeoff from Jakarta last Monday, killing all 189 people on board. The data recorder has been recovered. 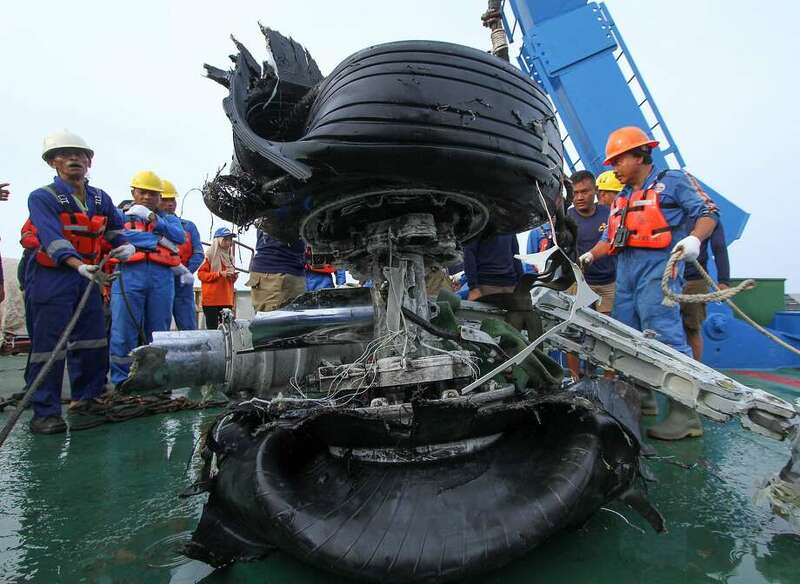 Workers secure a tire assembly recovered from the Lion Air jet that crashed a fter takeoff from Jakarta last Monday, killing all 189 people on board. The data recorder has been recovered. The Boeing 737 MAX 8 jet crashed just minutes after takeoff from Jakarta last Monday, killing all 189 people on board in the countryâs worst airline disaster since 1997, when 234 people died on a Garuda flight near Medan. The flight data recorder was recovered by divers on Thursday in damaged condition and investigators said it required special handling to retrieve its information. The cockpit voice recorder has not be en recovered but searchers are focusing on a particular area based on a weak locator signal. National Search and Rescue Agency chief Muhammad Syaugi said Sunday the search operation, involving hundreds of personnel and dozens of ships, would continue for another three days. Syaugi paid tribute to a volunteer diver, Syahrul Anto, who died during the search effort on Friday. More than 100 body bags of human remains have been recovered. Syaugi said the number would continue to increase and remains were also now washing up on land. He said weak signals, potentially from the cockpit voice recorder, were traced but the device hasnât been found yet due to deep seabed mud. Flight tracking websites show the plane experienced erratic speed and altitude during its 13 minute flight and a previous flight the day before from Bali to Jakarta. Passengers on the Bali flight reported terrifying descents and in both cases the different cockpit crews requested to return to their departure airport shortly after takeoff. Lion has claimed a technical problem was fixed after the Bali fight.